With the rack in the middle position, preheat the oven to 180 °C (350 °F). Butter and flour a 20-cm (8-inch) springform pan. Line the bottom with parchment paper. In the bowl of a food processor, combine the flour, sugar, cocoa powder, baking powder, baking soda and salt. Add the butter and blend until the texture is gritty but fine. Add the remaining ingredients and blend until the batter is smooth. Pour the batter into the pan and bake for about 1 hour 10 minutes or until a toothpick inserted in centre of the cake comes out clean. Let cool. Unmould and cool completely on a rack. In a saucepan off the heat, combine 60 ml (1/4 cup) icing sugar and flour. Add the egg and beat until the mixture is smooth. Gradually add in the hot milk while whisking. Bring to a boil over medium heat, whisking constantly and being careful to scrape the bottom and corners of the pan. Simmer for 1 to 2 minutes over low heat. To avoid forming a skin on the surface of the pastry cream, place a plastic wrap directly on the hot cream. Let cool and refrigerate until completely chilled, about 1 hour 30 minutes. Add the remaining icing sugar to the cooled pastry cream and whip with an electric mixer until the mixture is smooth. Add the butter, 1 or 2 cubes at a time, beating until the mixture is very smooth. Stir in the lukewarm chocolate. 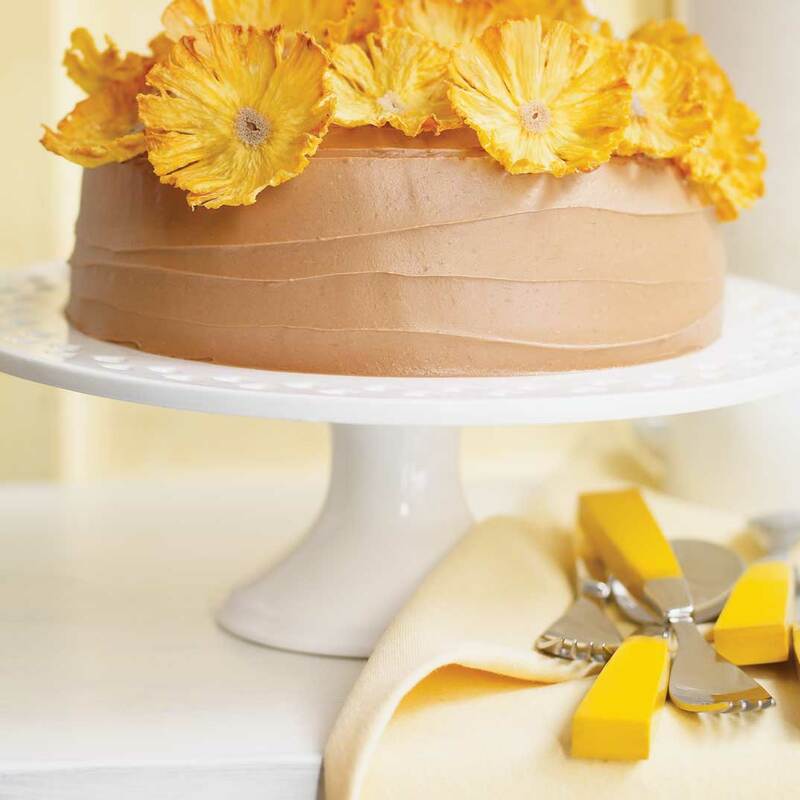 Cut the cake horizontally into four slices. Top each slice with about 125 ml (1/2 cup) of the chocolate frosting. Stack and frost the entire cake. 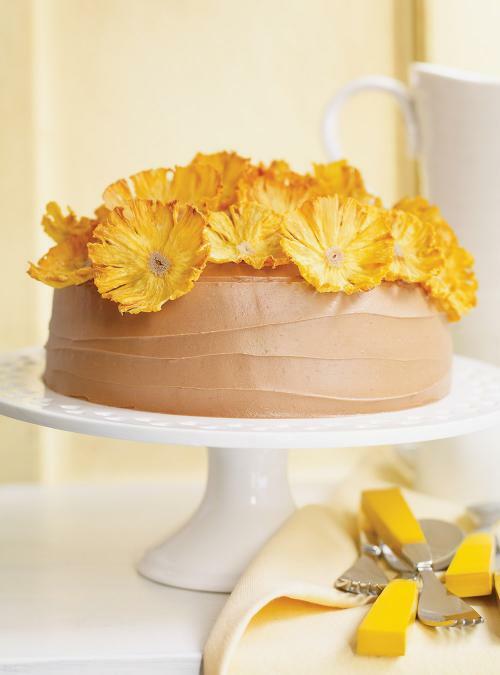 Decorate with dried pineapple flowers (see recipe). Store in a cake dome in a cool place. Avoid the refrigerator.